BidAir Cargo was established in 1996 as Express Air Services whose fleet of freighter aircraft operated an overnight hub-and-spoke domestic network. Over the years we have constantly evolved as a business, learnt lessons and have made numerous changes to our business model. Now as BidAir Cargo, we offer various African passenger airlines an airfreight services agreement to manage their under utilised cargo capacity. The airline gains revenue for the cargo capacity which BidAir Cargo manages and makes available to the express parcel industry. We have also developed other handling and marketing services for domestic and regional airlines. 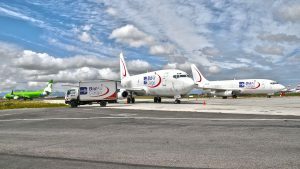 In 2014 BidAir Cargo acquired the business of Imperial Air Cargo which operates overnight freighter services in South Africa with a fleet of dedicated B737 freighter aircraft. Our values centre around a passion for service excellence, achieved through mutual respect, honesty, integrity and accountability, creating a stable work environment with well-trained and motivated people. BidAir Cargo is a 100% subsidiary of the Bidvest Group and reports into the Security and Aviation cluster of the Bidvest Services Division. BidAir Cargo has full accreditation from aviation regulatory bodies, including Part 108B regulated agent status in all our domestic branches and EU ACC3 for cargo moving through Cape Town, Durban and Johannesburg to the EU. Now as BidAir Cargo, we offer various African passenger airlines an airfreight services agreement to manage their under utilised cargo capacity. The airline gains revenue for the cargo capacity which BidAir Cargo manages and makes available to the express parcel industry. We have also developed other handling and marketing services for domestic and regional airlines. In 2014 BidAir Cargo acquired the business of Imperial Air Cargo which operates overnight freighter services in South Africa with a fleet of dedicated B737 freighters. With on-airport operations throughout the country, BidAir Cargo serves the courier and express logistics industry, providing airport-to-airport air line-haul and related services for express shipments and consolidations. BidAir Cargo handles cargo operations, administration and sales for passenger airlines by marketing their cargo capacity and schedules. BidAir Cargo also acts as GSA or GGHA to selected carriers. BidAir Cargo has full accreditation from aviation regulatory bodies, including Part 108B regulated agent status in all our domestic branches and EU ACC3 for cargo moving through CPT, DUR and JNB to the EU. Click here to view all certificates and accreditations. To complement our daytime services on scheduled carriers, we operate dedicated Boeing 737 freighters to connect JNB, CPT, DUR, PLZ, GRJ, ELS, and BFN in a hub-and-spoke network every night in South Africa. In Africa, BidAir Cargo offers flexible cargo management to airlines, couriers and cargo owners via our network in Nambia, Tanzania, Uganda, Zimbabwe, Kenya, Zambia, Mauritius, Rwanda, Southern Sudan. BidAir Cargo sits within BIDAir Services and is part of the internationally-listed Bidvest Group which offers a wide range of services to the aviation industry.